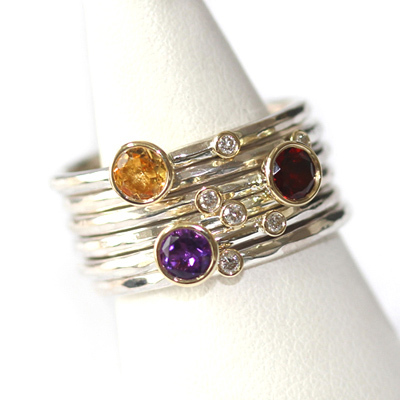 Portfolio (All Jewellery) — Form Bespoke Jewellers Ltd.
A versatile set of citrine, garnet, amethyst and diamond stacking rings. 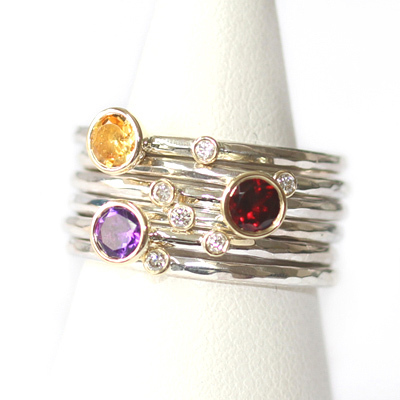 There are six individual rings is this stacking ring set. One boasts a citrine and diamond, one a garnet and diamond, another an amethyst and diamond, and three with solitaire diamonds. All the stones are round brilliant cut and rub set for a cool, contemporary style. Each ring can be worn individual. Or, they can be worn in varying combinations (depending on your outfit!). The bands of all of the stacking rings are cast in silver with a hammered finish. In contrast, the settings of each of the stones are cast in yellow gold. This trendy detail also allows for each stone to be beautifully framed. 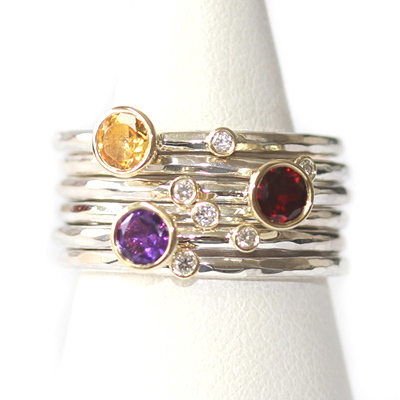 A bespoke and colourful stacking ring set.